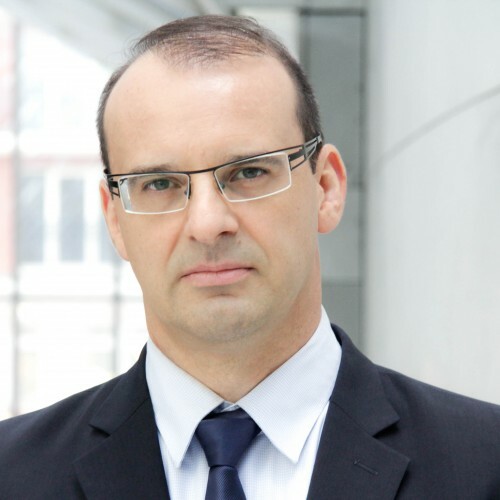 Martino Grasselli is Head of the Finance Group at the Pôle Universitaire Léonard de Vinci Research Center in Paris La Defense and he is Full Professor at the Mathematics department of University of Padua (Italy). After graduating in Mathematics (Padua, 1994) he received a Doctorate in Applied Mathematics in Trieste (1999) and a Ph.D in Quantitative Finance in Paris 1 Sorbonne (2001 ) as a fellow of CREST. He has been Assistant Professor at Verona Univ. (1999-2004) and Visiting Professor at Univ. Evry (France 2003), UTS (Sydney, regularly in 2010-2017), Dauphine (Paris, 2013). His teaching experiences cover doctoral courses (Padua, Verona), Master&MBA (Cattolica Assicurazioni Private Banking Verona, ESILV Paris la Defense), Quants seminars (Bloomberg New York, NATIXIS Paris, Prometeia Bologna), Executive Education (Foundation CUOA Altavilla VI, AIPB, Intesa Private Banking Milan). He is Co-founder of Quanta Finanza Srl, where he has held various positions as a technical consultant (CTU) in financial litigations (Courts of Milan, Padua, Treviso) and he is the Scientific Director of the Derivatives Project, involving the Mathematics Department of Univ. Padova and Confindustria Padova (confederation of small-mid-caps in Padova). To his credit has more than 30 research papers published in major peer review international journals and is often invited as a plenary speaker at international conferences: his research topics cover stochastic volatility, valuation of derivatives, model calibration, portfolio management, interest rates models and quantitative models for the management of demographic and mortality risks. Quantitative Finance, 17 (6), p. 855-872, 2017. In this paper we apply a new methodology based on quantization to price options in stochastic volatility models. This method can be applied to any model for which an Euler scheme is available for the underlying process and it allows for pricing vanillas, as well as exotics, thanks to the knowledge of the transition probabilities for the discretized stock process. We apply the methodology to some celebrated stochastic volatility models, including the Stein and Stein (1991) model and the SABR model introduced in Hagan and Woodward (2002). A numerical exercise shows that the pricing of vanillas turns out to be accurate; in addition, when applied to some exotics like equity-volatility options, the quantization-based method overperforms by far the Monte Carlo simulation. Mathematical Finance, 27 (4), p. 1013-1034, 2017. We introduce a new stochastic volatility model that includes as special cases the Heston (1993) and the 3/2 model of Heston (1997) and Platen (1997). The new model displays new features, namely the instantaneous volatility can be uniformly bounded away from zero, and it is highly tractable, meaning that the pricing procedure can be performed efficiently. This required the application of the Lie symmetries theory for PDEs, which allowed us to extend known results on Bessel processes. Finally, we provide an exact simulation and a second order discretization scheme for the model, which is useful in view of the numerical applications. Insurance: Mathematics and Economics, 71 , p. 205-219, 2016, ISSN: 0167-6687. In this paper we investigate the consequences on the pricing of insurance contingent claims when we relax the typical independence assumption made in the actuarial literature between mortality risk and interest rate risk. Starting from the Gaussian approach of Liu et al. (2014), we consider more general affine models where the mortality and interest rates remain positive and we derive pricing formulas for insurance contracts like Guaranteed Annuity Options (GAOs). In a Wishart affine model, which allows for a non-trivial dependence between the mortality and the interest rates, we go far beyond the results found in the Gaussian case by Liu et al. (2014), where the value of these insurance contracts can be explained only in terms of the initial pairwise linear correlation. Quantitative Finance, 16 (10), p. 1465-1477, 2016, ISSN: 1469-7688. The Journal of Futures Markets, 36 (2), p. 174-193, 2016. Operations Research Letters, 43 , p. 601-607, 2015, ISSN: 0167-6377. Quantitative Finance, 16 (4), p. 535-554, 2015, ISSN: 1469-7688. Journal of Banking and Finance, 53 , p. 34-48, 2015, ISSN: 0378-4266. Risk Magazine, 9 , p. 62-67, 2015, ISSN: 0952-8776. Journal of Applied Probability, 51 (3), p. 640-656, 2014. SIAM Journal of Financial Mathematics, 5 (1), p. 493-531, 2014, ISSN: 1945-497X. Studies in Nonlinear Dynamics & Econometrics, 18 (3), p. 253-289, 2014. Insurance: Mathematics and Economics, 58 , p. 774-793, 2014, ISSN: 0167-6687. We provide analytic pricing formulas for Fixed and Floating Range Accrual Notes within the multi-factor Wishart affine framework which extends significantly the standard affine model. Using estimates for three short rate models, two of which are based on the Wishart process whilst the third one belongs to the standard affine framework, we price these structured products using the FFT methodology. Thanks to the Wishart tractability the hedge ratios are also easily computed. As the models are estimated on the same data-set, our results illustrate how the fit discrepancies (meaning differences in the likelihood functions) between models translate in terms of derivatives pricing errors, and we show that the models can produce different price evolutions for the Range Accrual Notes. The differences can be substantial and underline the importance of model risk both from a static and dynamic perspective. These results are confirmed by an analysis performed at the hedge ratios level. Journal of Banking & Finance, 37 (10), p. 3799-3818, 2013, ISSN: 0378-4266. We introduce a novel multi-factor Heston-based stochastic volatility model, which is able to reproduce consistently typical multi-dimensional FX vanilla markets, while retaining the (semi)-analytical tractability typical of affine models and relying on a reasonable number of parameters. A successful joint calibration to real market data is presented together with various in- and out-of-sample calibration exercises to highlight the robustness of the parameters estimation. The proposed model preserves the natural inversion and triangulation symmetries of FX spot rates and its functional form, irrespective of choice of the risk-free currency. That is, all currencies are treated in the same way. Journal of Economic Dynamics and Control, 37 (4), p. 774-793, 2013, ISSN: 0165-1889. We present a flexible approach for the valuation of interest rate derivatives based on affine processes. We extend the methodology proposed in Keller-Ressel et al. (in press) by changing the choice of the state space. We provide semi-closed-form solutions for the pricing of caps and floors. We then show that it is possible to price swaptions in this multifactor setting with a good degree of analytical tractability. This is done via the Edgeworth expansion approach developed in Collin-Dufresne and Goldstein (2002). A numerical exercise illustrates the flexibility of Wishart Libor model in describing the movements of the implied volatility surface. Journal of Economic Dynamics and Control, 36 (4), p. 657-669, 2012, ISSN: 0165-1889. In this article we formulate and solve the optimal design problem of a defined contribution public pension fund, in a highly stylized but still rather general non-stationary framework. We adopt the viewpoint of a benevolent social planner who aims at treating in a fair manner the successive overlapping generations participating to such a long-term mandatory system. Using the approach of El Karoui and Jeanblanc (1998) for the optimal consumption and portfolio choice problem with random income in a complete market, we exhibit a solution to our intertemporal stochastic control problem where each generation receives a fair (lumpsum) retirement benefit: it is proportional to the contributions she has paid during her active worklife and follows a fixed common rule (although her pension value itself may depend on variables only observable at her retirement time). We next relax the assumption that the collective pension system is mandatory and investigate the performance of individual investment plans in the market. Comparing the outcomes of both alternatives, we derive a condition under which the collective fund can be expected to overperform the individual plan. In the special case of a stationary economy, such a possibility has been pointed out by Gollier (2008). In fact this effect results from the possibility for the collective fund to borrow today against contributions of future generations, which allows to implement riskier strategies and may improve its performance. Matematica e Impresa, 2 , 2012. Quantitative Finance, 11 (11), p. 1609-1632, 2011, ISSN: 1469–7688. Using a data set of vanilla options on the major indexes we investigate the calibration properties of several multi-factor stochastic volatility models by adopting the fast Fourier transform as the pricing methodology. We study the impact of the penalizing function on the calibration performance and how it affects the calibrated parameters. We consider single-asset as well as multiple-asset models, with particular emphasis on the single-asset Wishart Multidimensional Stochastic Volatility model and the Wishart Affine Stochastic Correlation model, which provides a natural framework for pricing basket options while keeping the stylized smile–skew effects on single-name vanillas. For all models we give some option price approximations that are very useful for speeding up the pricing process. In addition, these approximations allow us to compare different models by conveniently aggregating the parameters, and they highlight the ability of the Wishart-based models to control separately the smile and the skew effects. This is extremely important from a risk-management perspective of a book of derivatives that includes exotic as well as basket options. International Journal of Theoretical and Applied Finance, 14 (6), p. 899-943, 2011, ISSN: 0219-0249. In this paper, we quantify the impact on the representative agent's welfare of the presence of derivative products spanning covariance risk. In an asset allocation framework with stochastic (co)variances, we allow the agent to invest not only in the stocks but also in the associated variance swaps. We solve this optimal portfolio allocation program using the Wishart Affine Stochastic Correlation framework, as introduced in Da Fonseca, Grasselli and Tebaldi (2007): it shares the analytical tractability of the single-asset counterpart represented by the  model and it seems to be the natural framework for studying multivariate problems when volatilities as well as correlations are stochastic. What is more, this framework shows how variance swaps can implicitly span the covariance risk. We provide the explicit solution to the portfolio optimization problem and we discuss the structure of the portfolio loadings with respect to model parameters. Using real data on major indexes, we find that the impact of covariance risk on the optimal strategy is huge. It first leads to a portfolio that is mostly driven by the market price of volatility-covolatility risks. It is then strongly leveraged through variance swaps, thus leading to a much higher utility, when compared to the case when investing in such derivatives is not possible. Contabilità, Finanza e Controllo, 34 (2), p. 130-139, 2011. Quantitative Finance, 8 (6), p. 591-604, 2008, ISSN: 1469–7688. We model the volatility of a single risky asset using a multifactor (matrix) Wishart affine process, recently introduced in finance by Gourieroux and Sufana. As in standard Duffie and Kan affine models the pricing problem can be solved through the Fast Fourier Transform of Carr and Madan. A numerical illustration shows that this specification provides a separate fit of the long-term and short-term implied volatility surface and, differently from previous diffusive stochastic volatility models, it is possible to identify a specific factor accounting for the stochastic leverage effect, a well-known stylized fact of the FX option markets analysed by Carr and Wu. A multifactor volatility Heston model - ResearchGate. Available from: http://www.researchgate.net/publication/24086234_A_multifactor_volatility_Heston_model [accessed Jul 3, 2015]. Mathematical Finance, 18 (1), p. 135-153, 2008, ISSN: 0960-1627. An Affine Term Structure Model (ATSM) is said to be solvable if the pricing problem has an explicit solution, i.e., the corresponding Riccati ordinary differential equations have a regular globally integrable flow. We identify the parametric restrictions which are necessary and sufficient for an ATSM with continuous paths, to be solvable in a state spaceD+ × Rn-m, whereD+, the domain of positive factors, has the geometry of a symmetric cone. This class of state spaces includes as special cases those introduced by Duffie andKan (1996), andWishart termstructure processes discussed by Gourieroux and Sufana (2003). For all solvable models we provide the procedure to find the explicit solution of the Riccati ODE. Decisions in Economics and Finance, 30 (2), p. 95-018, 2007. In affine term structure models (ATSM) the stochastic Jacobian under the forward measure plays a crucial role for pricing, as discussed in Elliott and van der Hoek (Finance Stoch 5:511–525, 2001). Their approach leads to a deterministic integro-differential equation which, apparently, has the advantage of by-passing the solution to the Riccati ODE obtained by the standard Feynman-Kac argument. In the generic multi-dimensional case, we find a procedure to reduce such integro-differential equation to a non linear matrix ODE. We prove that its solution does necessarily require the solution of the vector Riccati ODE. This result is obtained proving an extension of the celebrated Radon Lemma, which allows us to highlight a deep relation between the geometry of the Riccati flow and the stochastic calculus of variations for an ATSM. Review of Derivatives Research, 10 , p. 151-180, 2007. In this paper we develop a novel market model where asset variancescovariances evolve stochastically. In addition shocks on asset return dynamics are assumed to be linearly correlated with shocks driving the variance-covariance matrix. Analytical tractability is preserved since the model is linear-affine and the conditional characteristic function can be determined explicitly. Quite remarkably, the model provides prices of vanilla options consistent with the smile and skew effects observed, while making possible to detect and quantify the correlation risk in multiple asset derivatives like basket options. In particular it can reproduce the asymmetric conditional correlations effect documented in Ang and Chen (2002) for equity markets. We exemplify analytical tractability providing explicit pricing formulas for rainbow ”Best-of” options. Decisions in Economics and Finance, 28 (1), p. 67-78, 2005. Economic Notes, 33 (3), p. 359-374, 2004. In this paper, we analyse the Affine Term Structure Model (ATSM) proposed by Balduzzi, Das, Foresi and Sundaram (BDFS, 1996) and provide the closed-form expression of the bond price. In addition, we extend the notion of Impulse Response Function to the class of ATSM. We show that it is closely related to the duration measure, and we compute it explicitly in the BDFS model. Journal of Economic Dynamics and Control, 28 (11), p. 2239-2260, 2004. The question we solve is the optimal design of the minimum guarantee in a Defined Contribution Pension Fund Scheme. We study the investment in the financial market by assuming that the pension fund optimizes its retribution which is a part of the surplus, that is the difference between the pension fund value and the guarantee. Then we define the optimal guarantee as the solution of the contributor's optimization program and find the solution explicitly. Finally, we analyze the impact of the main parameters, and particularly the sharing rule between the contributor and the pension fund. We find that favorable sharing rules for the pension fund lead to conservative guarantees for the contributor: the sharing rule is a way to create a continuum between two extreme pension funding methods that are Defined Benefit and Defined Contribution Pension Schemes, and the sharing rule allows partial risk transfer between the contributor and the pension fund manager. Banque & Marchés, 72 , p. 34-46, 2004. Insurance : Mathematics and Economics, 33 (3), p. 611-627, 2003. We study an investment problem where the interest rates follow the Cox–Ingersoll–Ross dynamics. The optimal investment strategy is obtained in explicit form under the hypotheses that financial markets are complete and that the utility functions belong to the HARA, exponential and logarithmic classes. We show that the solution for the HARA utility is stable when the parameters vary in a suitable way: more precisely, we find that the optimal investment strategy corresponding to the HARA function converges almost surely to the one corresponding to the exponential and logarithmic utility functions. Insurance: Mathematics and Economics, 33 (1), p. 189-207, 2003. In a continuous-time framework, we consider the problem of a Defined Contribution Pension Fund in the presence of a minimum guarantee. The problem of the fund manager is to invest the initial wealth and the (stochastic) contribution flow into the financial market, in order to maximize the expected utility function of the terminal wealth under the constraint that the terminal wealth must exceed the minimum guarantee. We assume that the stochastic interest rates follow the affine dynamics, including the Cox–Ingersoll–Ross (CIR) model [Econometrica 53 (1985) 385] and the Vasiček model. The optimal investment strategies are obtained by assuming the completeness of financial markets and a CRRA utility function. Explicit formulae for the optimal investment strategies are included for different examples of guarantees and contributions. Journal of Applied Probability, 1 , p. 1-15, 2000. We study an optimal investment problem in a continuous-time framework where the interest rates follow Cox-Ingersoll-Ross dynamics. Closed form formulae for the optimal investment strategy are obtained by assuming the completeness of financial markets and the CRRA utility function. In particular, we study the behaviour of the solution when time approaches the terminal date. Insurance: Mathematics and Economics, 25 (3), p. 295-306, 1999. We define the concept of conditional dominance and use it for obtaining bounds on the hedging prices of random variables. These bounds depend only on the characteristics of the financial market and the random variables to hedge. Moreover, they are coherent with the equilibrium and tighter than the ones obtained by the classical super-replication approach, significantly in some cases. This approach can be applied in static as well as dynamic frameworks. Rendiconti per gli Studi Economici e Quantitativi, p. 92-107, 1999. Mathematical Finance, 27 (4), p. 1013-1034, 0000. Progetto Libreria, Padova, Italy, 2010, ISBN: 9788896477120. Grasselli, M.; Fiorin, L.; Callegaro, G.
Quantitative Methods in Finance QMF2017, Sydney, Australie, 12-15 december., 2017. Mathematics in Finance 2017 International Conference, Cape Town, South Africa, 2-3 november, 2017. Mathematics and Finance: Research in Options, Rio de Janeiro, Brazil, 25-30 november, 2017. 8th General AMaMeF Conference, Amsterdam, June 19-23, 2017. Second Paris-Asia Conference in Quantitative Finance, Suzhou, China, 26-27 mai, 2017. Grasselli Martino; Callegaro G.; Fiorin L.
Quantitative Methods in Finance QMF 2016 , Sydney, Australia, 2016. Mathematics and Finance: Research in Options, IMPA, Rio de Janeiro, Brazil, 2016. Workshop in Quantitative Finance, Pisa, Italy, 2016. Université de Paris I Panthéon Sorbonne, 2001. Nous proposons des modèles mathématiques appliqués à la gestion des fonds de pension, et de façon plus générale à celle des institutions financières dont l 'horizon temporel est assez long (30 ou 40 ans). Dans la première partie nous explicitons la stratégie optimale d'investissement du problème de consommation-investissement lorsque les taux d'intérêt suivent la dynamique (stochastique) proposée par Cox, lngersoll et Ross ( 1985) et lorsque la fonction d'utilité est du type HARA ou exponentiel. L'approche utilisée est l'approche par martingale développée par Karatzas et al. ( 1987) dans le cadre de marchés complets. Nous étendons alors les résultats dans deux directions: structure des taux multifactoriels et fonctions d'utilité plus générales. Comme application, nous considérons le cas des fonds de pension à contributions définies et minimum garanti. Dans la deuxième partie, on s'intéresse à l'incomplétude du marché. Nous introduisons un critère, que nous appelons Dominance Conditionnelle, qui nous permet d'obtenir des bornes sur la valeur de tout actif contingent. Ces bornes ne dépendent pas des caractéristiques des agents et dans certains cas elles sont strictement meilleures que celles obtenues par sur-réplication. Comme application, nous considérons le cas d'un fond de pension à prestation définie. En utilisant le critère de Dominance Conditionnelle, nous pouvons trouver explicitement la borne supérieure pour la valeur de prestation définie, ainsi que la stratégie de couverture. Università degli Studi di Trieste, 1999.